Taking a page from the IT playbook, calculate TCO in terms of projector lamp life, brightness levels, and energy usage. Recent years have seen many IT-driven innovations migrate to the AV marketplace. These new tools and technologies are augmenting both the operational and performance efficiency of devices, improving the flexibility of installations, and lowering the total cost of ownership (TCO) of AV solutions. Using best practices from the IT sector, AV professionals can fully leverage these opportunities as they begin to merge to AV applications. The first major change in the way schools and businesses operate their AV equipment has been the introduction of LAN control technology. By transferring this innovation to AV devices, IT managers gain the ability to control and monitor devices with greater ease, resulting in both a simpler and more integrated remote monitoring and management workflows. Within the context of education, LAN control also enables administrators to operate equipment and manipulate devices directly via their LAN in order to reach multiple units in classrooms, auditoriums, and other assembly spaces. In addition to operational advantages, LAN control can lead to more efficient energy consumption and the slower degradation of device components. A second LAN-based innovation is LAN display, which enables audio, video, and data to be delivered over a single LAN cable. By replacing VGA cables with LAN connections, users can eliminate the cost of building long specialized cables to run media to and from devices, thus simplifying installations. In addition, Standard Cat-6 cables can carry control information, starting with simple LAN display features found on today’s projectors to the more sophisticated control systems and HDMI switchers offered by AMX and Crestron. TCO is an IT industry standard for determining the total operational costs of technology. When applied to AV equipment—especially projectors—relevant factors include lamp life, brightness levels, energy usage, and reusable components. In 2006, a typical projector lamp within business applications produced 2,000 ANSI lumens of brightness and lasted approximately 2,000 hours. Today, lamp technology has evolved to offer at a minimum 3,000 lumens of brightness while lasting an impressive 10,000 hours, dramatically lowering a device’s TCO. Another simple factor which can reduce lamp-related costs is lamp door placement. For organizations with several projectors, labor costs linked with lamp replacement can accumulate quickly, especially in ceiling projectors where devices need to be dismounted for servicing. With the new advancement of top-mounted lamp doors, lamp replacement time is greatly reduced, as are labor costs associated with maintenance. When it comes to brightness, most projectors begin to lose their luminosity shortly after their first use. This decline continues until the level drops to 50 percent and lamps need to be replaced. In contrast, today’s advanced projectors produce steady brightness levels during their first three years of regular use, resulting in better performance in settings such as classrooms where usage is sustained over long periods of time. 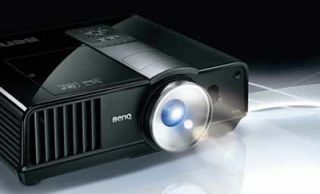 Power-saving technology has also begun to appear in today’s leading projectors. Advancements such as BenQ’s SmartEco technology will automatically adjust lamp power to match both the ambient light setting and content being projected onto the screen. The result is the retention of an optimum color spectrum and the provision of improved contrast ratios while simultaneously reducing power consumption. Most modern projectors also feature a “sleep” function which blocks lamp light using a small plastic door, resulting in wasted energy. Conversely, with such an innovation, power is automatically reduced by up to 70 percent when the lamp is lit but content is inactive, providing users with a blank screen whenever required. This function is especially useful in classroom and boardroom settings, where projectors are frequently turned on and off. In terms of components, some projectors still require filters while most of today’s DLP devices have gone filter-free. In addition to keeping the intake and exhaust vents clear—similar to desktop PCs—filter-free devices eliminate the costs of regular filter cleaning and filter replacement since the projectors’ DLP chips are completely sealed off. In most other projector types, manufacturers make recommendations on when to clean or exchange filters, or include sensors, which are activated when filters need attention, creating additional costs for users as well as service staff responsible for the maintenance of devices. By embracing the crossover of IT innovations into the AV space and applying the principles of TCO, users can benefit from more efficient workflows and better device performance while extending the lifecycles of their equipment. In turn, they are able to access new AV applications in more venues and facilities. Bob Wudeck is the associate vice president of strategy and business development at BenQ America Corp.